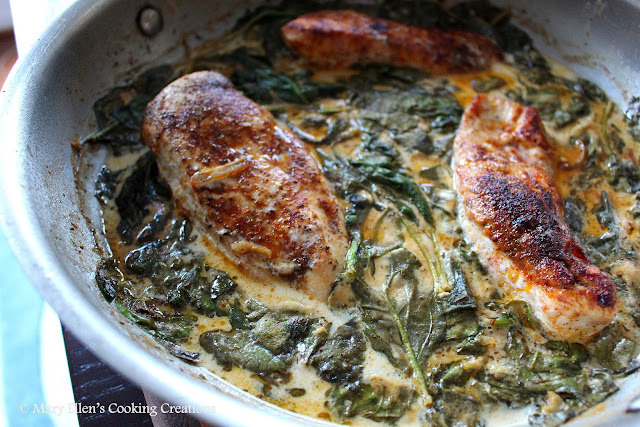 A few weeks ago my friend Sarah from Taste of Home Cooking posted a recipe and glowing review for Lemon Butter Chicken. Before even reading the recipe - solely based on her review - I saved it and knew I'd have to make it. That's how much she raved about it! 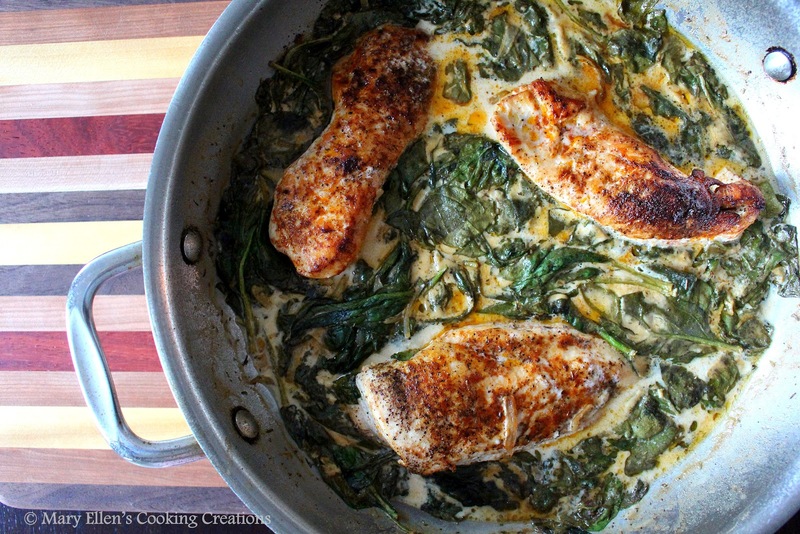 Picture the flavor of chicken picatta - that lemony sauce - but made even better by turning it into a creamy, slightly cheesy dish with wilted spinach. That is exactly what I thought of when I took my first few bites. I was nervous at first about mixing lemon and cream, but it works. It totally works. And this was easy, too. You sear your chicken, mix your sauce, and then return everything to the pan to bake for 20 minutes. You'll want to make sure you serve it with some noodles, pasta, mashed potatoes, or even some crusty bread for sopping up all that sauce. 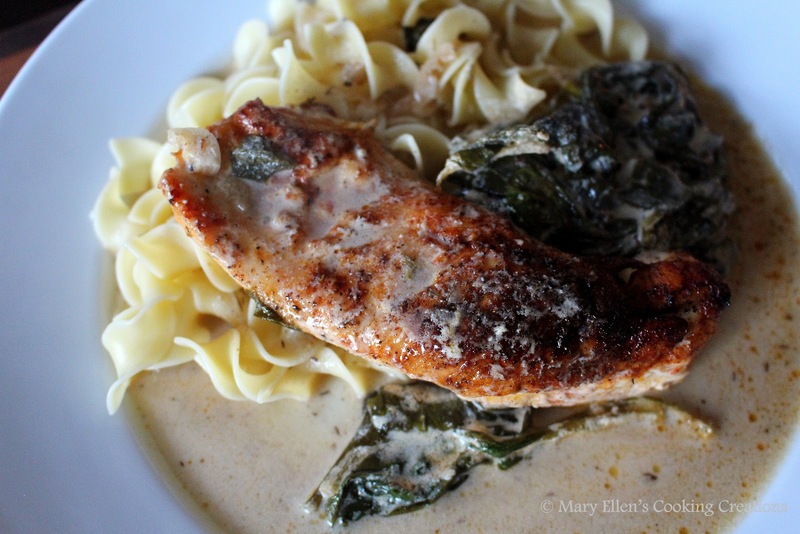 Thank you, Sarah, for sharing this recipe! Slightly Adapted From: Taste of Home Cooking The original recipe calls for bone-in, skin-on chicken thighs. I changed that to boneless chicken breasts just based on our preferences. That also cut 10 minutes off the total cooking time. I also used regular paprika instead of smoked (again, personal preference) and added some sliced onions. Next time I'll make one other change - I won't add the spinach until 3 minutes until the dish is done cooking. 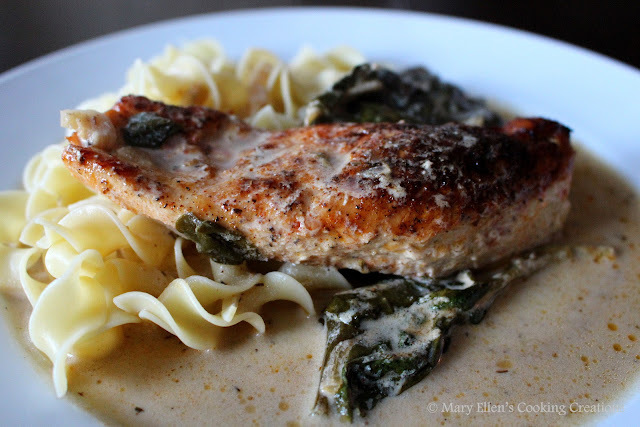 While the spinach did have a creamed spinach feel, I did not care for the consistency after it cooked for so long. I think I'd also play around with using some fresh lemon zest at the end. Season the chicken with paprika, salt and pepper, to taste. Combine the chicken broth, light cream, Parmesan, lemon juice, and thyme in a measuring cup or bowl. Melt 2 Tbsp of the butter in a large oven-proof skillet over medium high head. Add the chicken; sear both sides until golden brown, about 3-4 minutes per side. Remove the chicken to a plate. Melt the remaining Tbsp of butter in the skillet. Add the onions and garlic and cook, stirring frequently, until fragrant, about 1 minute. Stir in the sauce ingredients (chicken broth, etc.) you combined earlier. Bring to a boil and then reduce heat and stir in the spinach (see my note about waiting until the dish is almost done before adding the skillet). Place the chicken back in the skillet. Put the skillet in the oven and cook for 20 minutes or until internal temperature of the chicken reaches 165 degrees (F). Remove from the oven, remembering to place a pot holder on the handles so you don't burn yourself. Serve immediately.